Thank you to Georgia Aquarium for hosting our visit. All opinions are my own. Prepare to be awed, amazed and “edutained” when you visit Georgia Aquarium in Atlanta, Georgia. The aquarium is ranked as #1 in the United States, and now we know why. 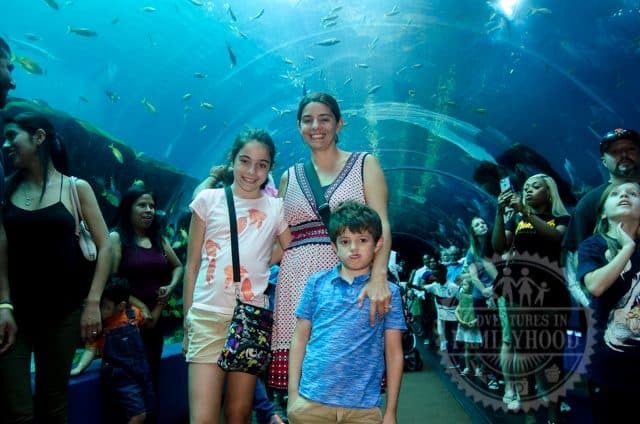 Georgia Aquarium is an engaging experience for kids and people of all ages. Through their exhibits and shows they are able to weave together fun with interactive learning. “Edutainment” as they call it, helps them achieve their goal of promoting aquatic conservation and research. But what sets them apart is they way they convey this message to their guests. 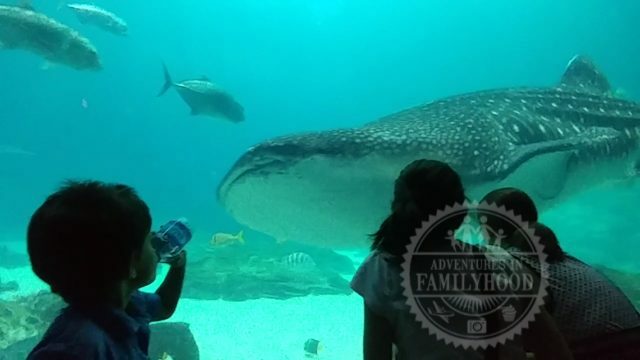 Their larger than life exhibits, hands-on experiences and entertaining shows let visitors get up close and personal with their favorite sea creatures, seeing them in a way they have never experienced before. While we were able to see just about everything the aquarium had to offer, there were some highlights. 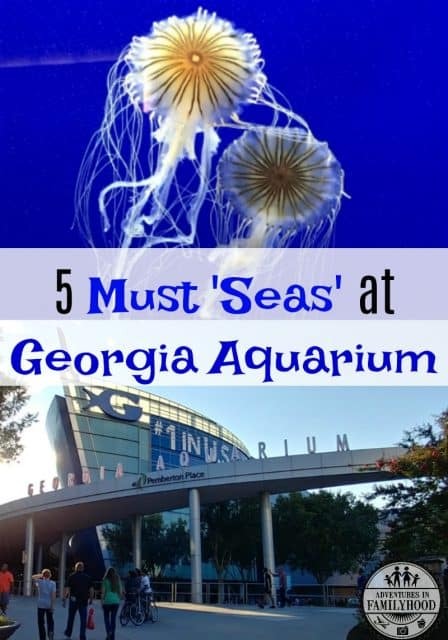 Here’s what we consider to be our must ‘seas’ when you visit Georgia Aquarium. Visit the California Sea Lions of Pier 225. You’ll first be treated to an interactive animatronic pre-show before you are escorted Under the Boardwalk. There you’ll meet your hosts, the California Sea Lions and their trainers. On our visit we were entertained by Neptune, Jupiter and Diego, all of which were rescued by Georgia Aquarium. It was amazing to see the close relationship they have with their trainers. Feeling brave? Sit in the first few rows also known as the splash zone. Be sure to check the times guide on the map as the times of the show vary each day. *Please note that no video or photography is allowed during the show. AT&T Dolphin Celebration is the aquarium’s new experience that showcases the beauty and grace of the bottlenose dolphin. The show combines showstopping tricks with message-filled videos about dolphin care and conservation. It’s unbelievable to see how talented the aquarium’s 12 dolphins are. During the show, you’ll see them jump, dive and even dance! This was by far our favorite experience of the day. The first 10 rows of the theater are in the splash zone. Take our word for it, you will get wet! Be sure to arrive 30 minutes before showtime because this is one show you won’t want to miss. Have you ever wondered what it would be like to get up close and personal with whale sharks, sea turtles and sting rays? In the Ocean Voyager exhibit you can do just that without setting foot off dry land. This 6.3 million gallon salt water habitat is home to 4 whale sharks, 4 manta rays and many more amazing aquatic creatures. You can easily view them all from their giant acrylic tunnel and 4,547 square foot viewing window. The acrylic tunnel is a walk through experience where you’ll see creatures swimming on all sides of you. Feel free to take your time through the tunnel by riding the slow moving people mover. Just wait until a whale shark swims right above you. There’s absolutely nothing like it. Around the corner is the full wall viewing window. We camped out in front of the window for at least a half an hour, just in time to see the whale sharks get fed. There were a few moments when the whale sharks passed right in front of the window. It’s only then that you realize just how massive these sea creatures are. 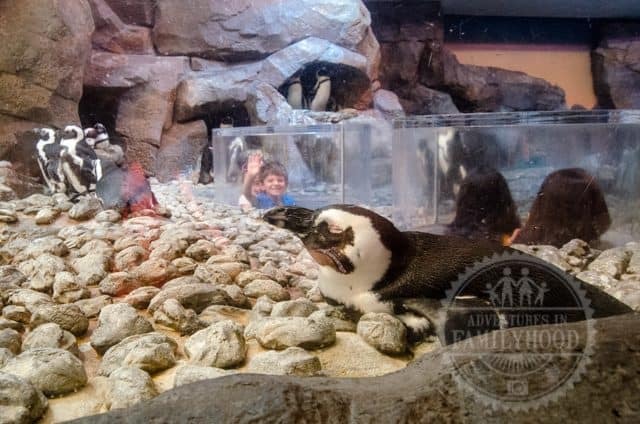 We’ve visited other aquariums before that had penguin exhibits, but Georgia Aquarium has the most unique penguin experiences we’ve ever seen. In the Cold Water Quest exhibit, you’re invited to crawl through a tunnel that takes you inside the penguin habitat. Viewing domes provide a unique way to take a peek of the penguins on land. Underneath, the penguins literally swim between you and the guests waiting on the other side. Want another way to see these adorable creatures? 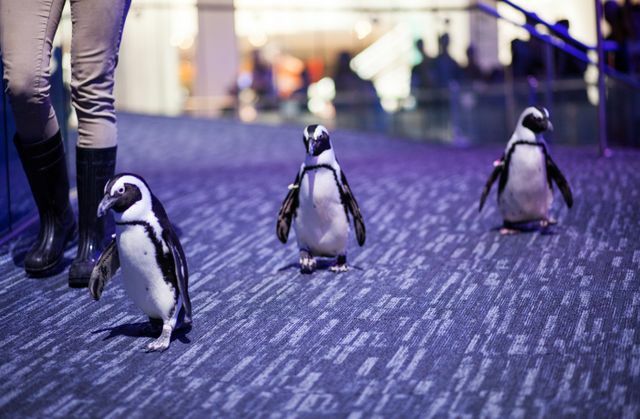 Georgia Aquarium holds a “Waddle Walk” in the main atrium. It’s like a penguin fashion show as they are brought out to strut their stuff on a runway for all to see. You’ll want to stake out a spot early for the best viewing and photo opportunities. Last, but certainly not least, visit one of the largest living reef experiences in the world in the Tropical Diver exhibit. Living coral and colorful fish are on display in this realistic recreation of a Pacific coral reef. 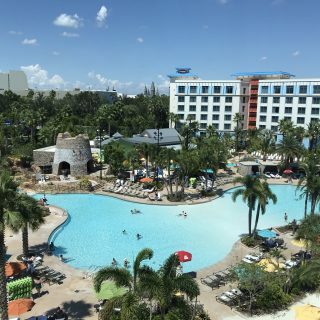 Kids will love searching the reef for Nemo and Dory among other recognizable creatures. Every few minutes, a crashing wave can be seen and heard overhead. The aquarium suggests visiting this exhibit as a relaxing ending to your day. Hours of operation vary by day, so be sure to check the calendar on their website before your visit. Download their mobile app for access to the daily schedule, show times, and special events. Purchase tickets online for $3 off general admission tickets. We found it was fairly easy to get through the entire aquarium during our visit. Georgia Aquarium suggest devoting 3-4 hours exploring their facility. Arrive early as the aquarium can get very crowded, especially on weekends. No outside food or drink is allowed in the aquarium. 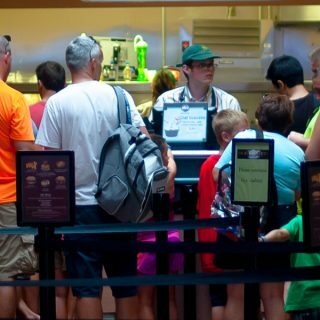 Meals and snacks can be purchased onsite in various locations. Cameras are allowed, however flash photography is strictly prohibited. 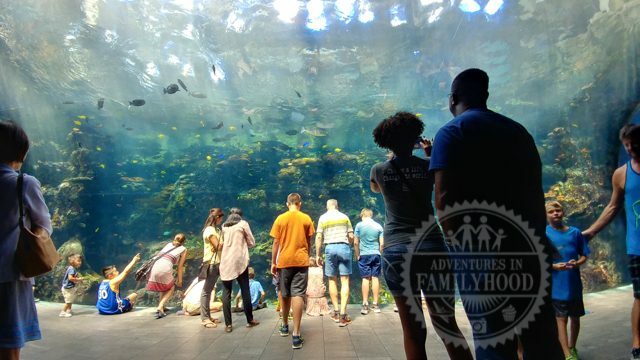 Georgia Aquarium offers daily military discounts of 10% with a valid military ID, and free admission for active military through their Military Mondays program. 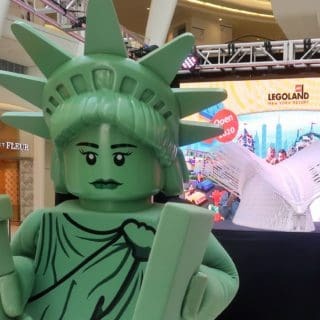 Visiting Atlanta? 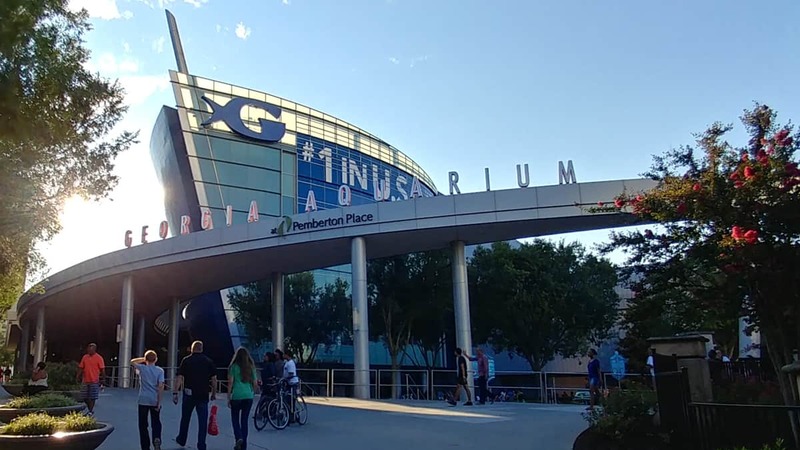 See Georgia Aquarium plus 4 other attractions with City Pass. 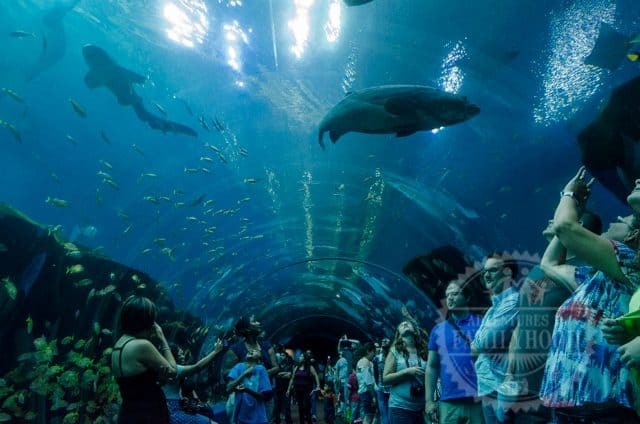 Visit “Georgia Aquarium” and 4 other attractions at a savings of 40% with CityPASS. Shop Today! SO FUN! We went a couple of years ago and LOVED the GA Aquarium. We sat right in the splash zone. It was wet but so much fun. Wow! The aquarium looks like so much fun! I’ve been to a few across the country, but will definitely need to put Georgia’s on my list!